Welcome to our new section all about doing good for the benefit of the Earth, the toads, and all living beings. This section will be filled with links and articles, information and enlightenment. This is a special section designed for those who want to make a positive difference in the world, not to feather their caps or put the equivilent of "Girl Scout Brownie Badges" on their spiritual sash, but to selflessly make a true and real difference in the world. Even tiny things like bringing a cloth bag to the supermarket is a big way to do good. 2008 is the Year of the Frog! 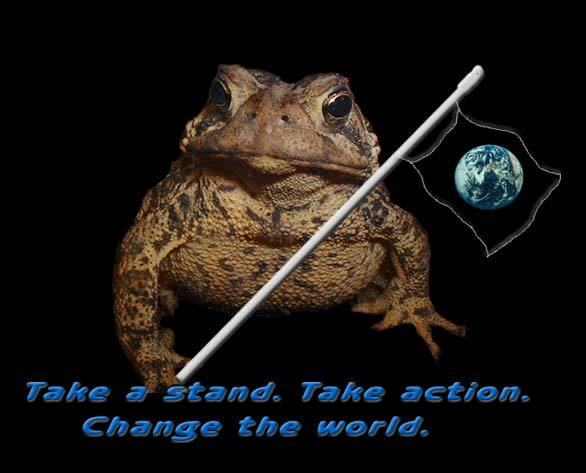 Please visit the website of the Amphibian Ark Project and learn what YOU can do to help the global amphibian crisis taking place right NOW! Help wildlife in your own yard! Ways to make a big contribution without leaving home. (article coming soon). The Toadily Toads Earthian Award! Read about people we've given a virtual award of recognition to for their outstanding efforts to make a difference. Little things Mean A Lot. Small ways you CAN make a big difference for the better. The light bulb problem: To use or not to use? When it comes to compact flourescent, that is the question. Click here to learn proper disposal and more on the best-bulb debate.